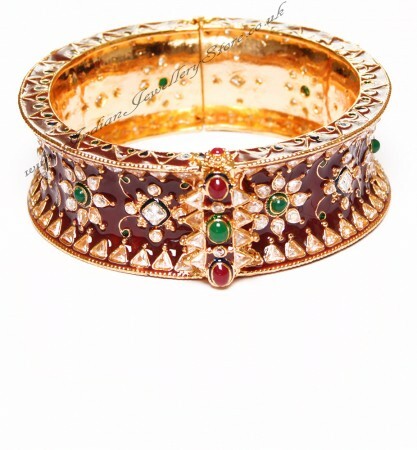 1 x Indian bangle in 22k gold plated with black antique & maroon red & tiny accents of bottle green. Set with meena work & polki stones. Size: 2.8 (large) - although there is a screw fastening so will fit other sizes. Bangle thickness: 2.6cm aprox. Indian Jewellery Store LOVES this product. This Rajasthani inspired bangle has stunningly fine stone & enamel work.